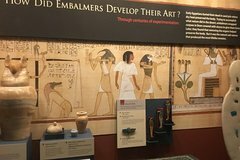 Ancient Egypt tour in DC is a quick guided journey through ancient Egypt in the Smithsonian museum of the natural history in Washington D.C, this trip makes the distance short between you and ancient Egypt and reveals a lot of secretes and answer a lot of questions you been asking for long time about this great civilization in few hours from Egyptian tour guide and Egyptologist who spend almost 20 years in trips all over Egypt. Start time for the tour is 10:30 am . The tour also includes introduction about Ancient Egypt, The religion in Ancient Egypt, The tombs in Ancient Egypt, The art in Ancient Egypt. More Over a briefing about modern Egypt by the end of the tour session.